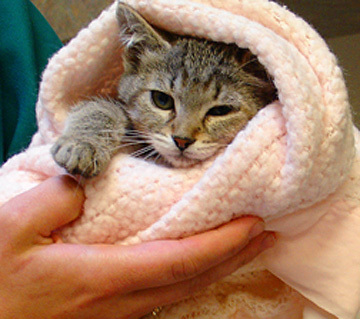 When it was time for Clover's check-up, the tiny kitten eagerly crawled her way into the warm arms of the veterinarian who examined her. Her loud purr shook her entire body - all 1.75 pounds of her! She appeared to be healthy, yet Clover kept winking and squeezing her eye shut. A closer look revealed that she had an abnormal growth of eyelashes, which resulted in a painful condition where the eyelid turned in slightly and the eye lashes constantly poked and rubbed on her cornea. Correction of this required surgery performed by an ophthalmologist. Clover was 8-weeks-old and was expected to heal quickly from the surgery. Thanks to generous donations received to help little Clover, she took a trip to the opthalmologist and was an ideal patient. 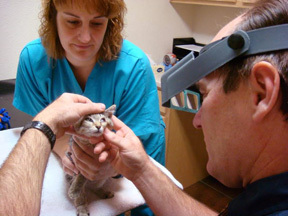 As you can see on the left, Clover was relaxed during her eye exam and trusted the gentle people who cared for her. The doctor treated Clover and it wasn't long before she was ready to find a new home. Clover is a spirited kitten who loves to be held and to play. She was adopted by a loving family less than four hours after being placed into adoption.